Have you ever wished you could tell a parent what you thought of what they had taught you, and not have them interrupt? 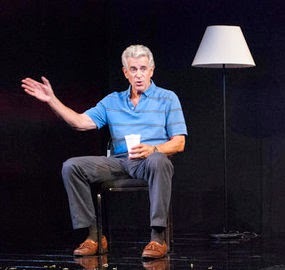 In Cedars, a one-man play in five acts starring the talented James Naughton, currently at the Fitzpatrick Main Stage theatre, this premise is examined from the perspective of a self-absorbed 59 year old lawyer who talks to his comatose father while his own life is falling apart. The imagined location is the Cedars-Sinai hospital in Los Angeles, and the script, penned by Erik Tarloff is full of LA-speak; the criticism of pop culture, morals, and fractured families. Naughton is commanding on stage. His rich voice is polished and every syllable is clear. Director Kiera Naughton (his daughter) has some good ideas; shifting the passage of time visually with projections and costume changes, and setting up hospital background sounds from the time the house is open are nice touches, but the minute Gabe, the lawyer is introduced by way of jarring music, the hospital illusion falls apart. Gabe could be anywhere, and until the end of the fifth act, the fact that he’s speaking to his father seems irrelevant, if not inappropriate. Naughton spends a good deal of time wandering around the stage, without clear physical moments to help punctuate the story. But when Gabe’s moment of truth emerges, the scene is heartbreakingly beautiful. The problems with the show are in Tarloff’s script. The over-written dialog is too literary for this type of intimate show, and some of the dialog is crude and insensitive. Naughton gets a few moments where he shines like the star he is, but even he has a hard time overcoming the dialog that masks the truth Gabe and the audience need to find to make this show really memorable.